Docx is a new default file saving format being introduced in Word 2007 that is based on Open XML and uses ZIP compression to reduce the overall file size. However, you probably don’t want the file to be saved under docx format due to many people are still using Office 2000/2003/XP without Microsoft Office Compatibility Pack being installed, that make the new file format not fully compatible with existing word versions. 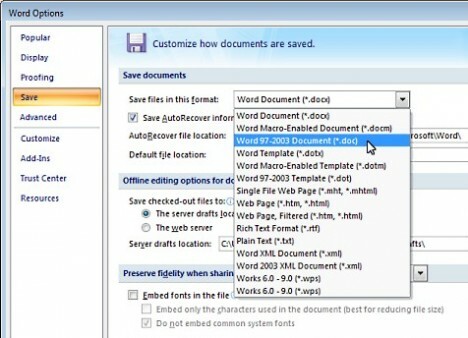 Instead of changing the file format from docx to doc each and every time when you want to save a file, now you can change the default saving format directly by following the below steps. 4) Under Save documents section, click on the drop down of “Save files in this format”, then choose “Word97-2003 Document (*.doc)”. 5) Click OK button the save the setting. Hopefully these simple steps will save you some time if you intend to change the default file format as I have spent some effort trying to locate it in its totally fresh interface for much productive daily work.